The Plaza Conference Room is located on the Plaza Level of Building Two of The World Trade Center Portland. From Building One of The World Trade Center Portland, cross SW 1st Street at the crosswalk, and enter one of the gates to the Outdoor Plaza. Once there, look for the Plaza Conference Room signage on the windows. From Building Three of The World Trade Center Portland, go up the escalators and walk North. 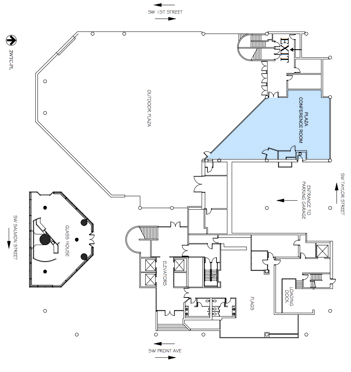 Take the elevators or stairs down two levels to the Plaza Level. 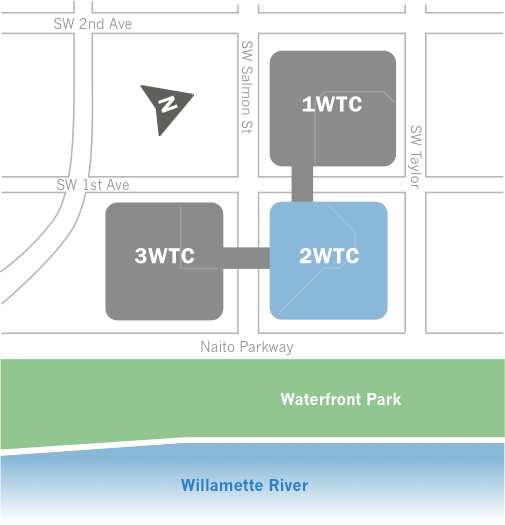 If you are parked in the City Center Parking Garage directly below Building Two of the World Trade Center Portland, take the elevator up to the Plaza Level. From elevator lobby on the Plaza Level, head West towards SW 1st Street, and the Plaza Conference Room will be on your right hand side. You may also select your event on our digital reader board for assistance from our interactive map. 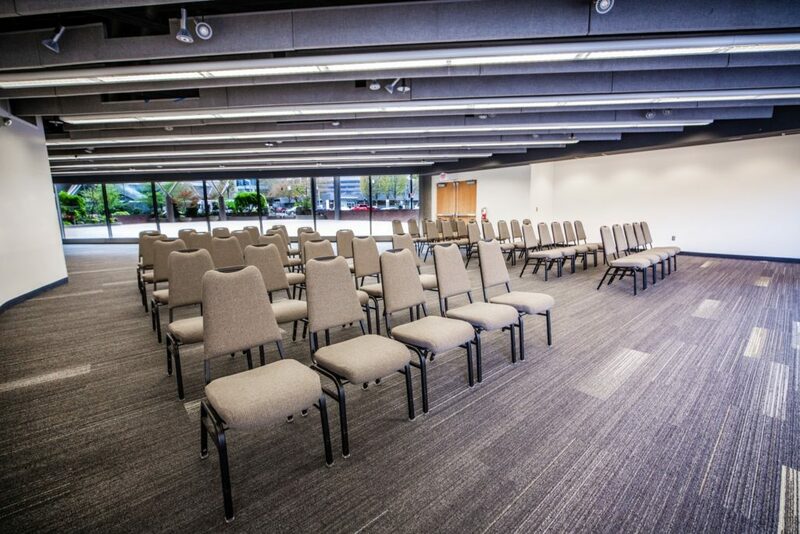 The Plaza Conference Room provides convenience of accessibility for attendees, and separate location from the other conference rooms. Two of the walls are made of glass allowing an ample amount of natural light through, and this creates an open feel to the space. There are private restrooms located in the lobby just outside the double wooden doors. The Plaza Conference Room is a flexible space that can be used for many different events from receptions to trainings. 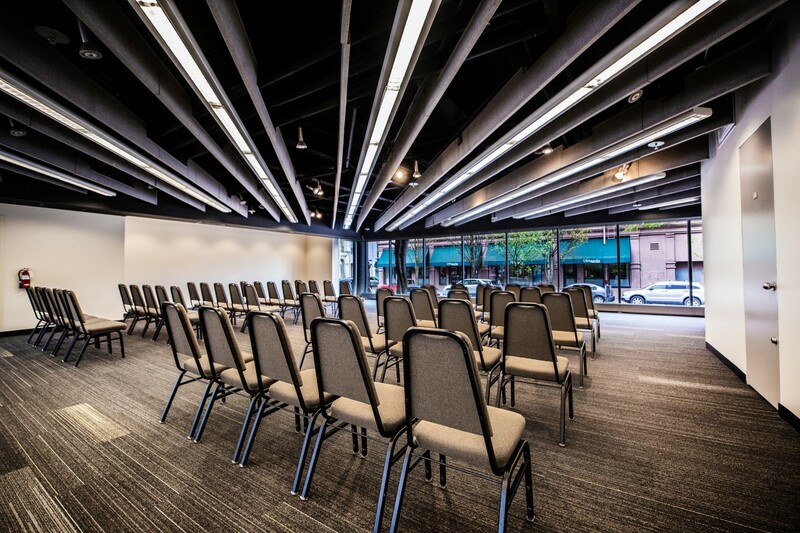 With a built in sound system, the Plaza Conference Room can accommodate your sound requirements for your meeting, luncheon, or reception. Looking for an indoor/outdoor space? Combine the Plaza Conference Room with our Outdoor Plaza for a great option for your next reception! Our Event Team would be happy to chat more about this option.